When we were in New York waiting to head down to club/bar Avenue for a party, we wanted to find a restaurant in Chelsea that was nearby. Walking past the bustling Cafeteria restaurant, we couldn’t help but be seduced. Rammed, noisy, fun and totally overpriced, it was full. With so many restos in Manhattan it is never difficult to find a good place to eat so, without waiting the 20 minutes for a table we crossed the street and headed into Merchants NY which, at pretty much oppoiste, was more modestly full and totally delicious. Try the BBQ chicken wings to start – they are amazing! Then choose anything other than the pasta and you will be happy campers. 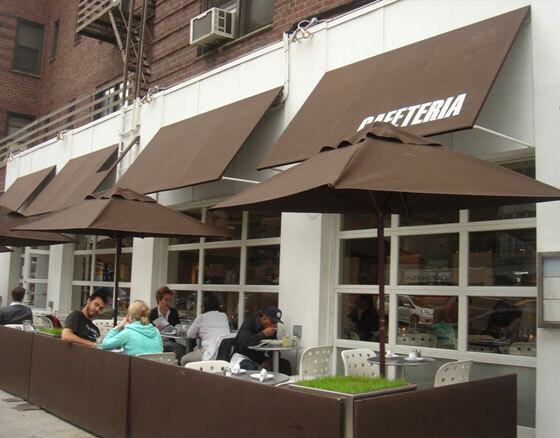 However, if you are coming AFTER Avenue, Cafeteria is great because it serves up American greats like Mac and Cheese 24/7 – in typical NY fashion – it NEVER shuts! Great for when you have had too many cocktails.